Recorded in the stunning acoustic setting of Vancouver’s Chan Centre for the Performing Arts with GRAMMY award-winning producer Steve Barnett, Wandering Heart is simply beautiful. This is the choir’s first recording since 2011, and its first recording under the direction of Erick Lichte. Founded in 1992 by acclaimed conductor Diane Loomer the Chor Leoni Men’s Choir, which is “known internationally and loved locally”, is recognized as one of the world’s foremost male vocal ensembles. 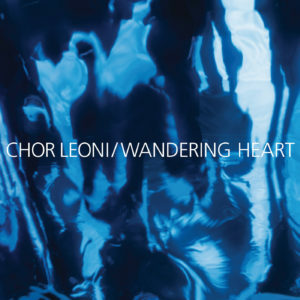 Chor Leoni prides itself on its musical ambassadorship for Vancouver and Canada and has performed at major festivals and concert venues across Canada and the United States. Internationally, the choir has shared its music in Italy, Croatia, Bosnia, Germany, and the Czech Republic. Erick Lichte has carved out a distinct niche in the vocal music world and concert life in North America. As a founding member, singer and artistic director of the male vocal ensemble Cantus, Lichte created and sustained one of only two full-time vocal ensembles in the United States. His work with Cantus garnered the 2009 Margaret Hillis Award for Choral Excellence, the highest honour for the professional choral organization Chorus America. As a choral conductor, Lichte has served as conductor for many professional, educational and amateur choral ensembles. In January of 2013, he began his tenure as Artistic Director of Chor Leoni Men’s Choir. Lichte is an active clinician and guest conductor, and is especially passionate in his work to get young men singing. Lichte is a published composer and arranger, especially known for his writing in All is Calm: The Christmas Truce of 1914 which has been taken on seven North American tours. Sure on This Shining Night (track #11) by Morten Lauridsen with text by James Agee from Description of Elysium is published by Hal Leonard. This is a beautiful, thoughtful, and solid performance of a contemporary classic by America’s composer laureate.